Thank you for your interest in our agent landing page. We offer this platform as an annual package for you to use in your marketing efforts and provide real estate sellers a place to learn about you and contact you. You may choose either design option below at the same price of $799 per year for as long as you keep the platform. This includes all hosting and email services as well. You will be responsible for your own domain. We have a somewhat automated sign-up process which will provide us with all of the information we need to build the website; then once you confirm everything, we will build the website and you will be invoiced accordingly. 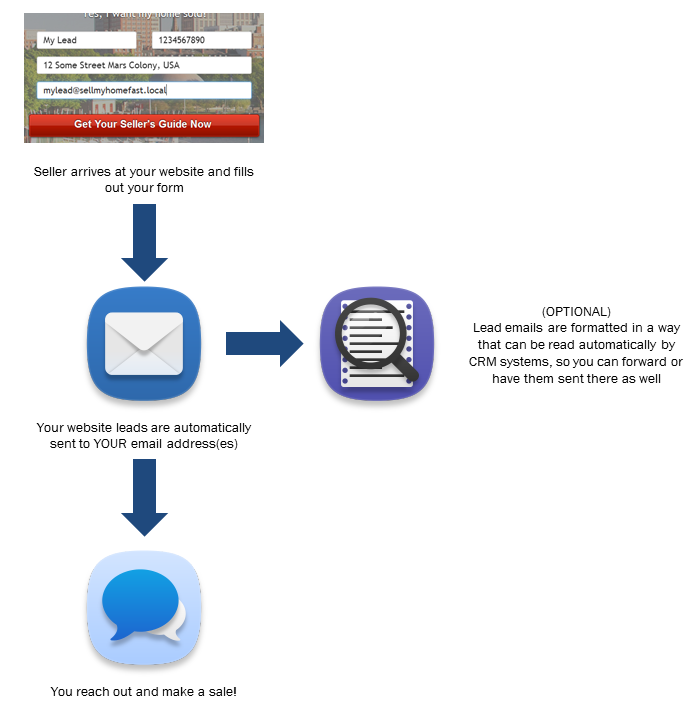 Option 1 is the "traditional" sales-focused landing page where all information is on the main page. The site fades in and has a convenient sliding testimonial list under the agent image. Option 2 is our more modern version of the sales-focused landing page. Testimonials scroll at the bottom, but instead of having the 3 "content" boxes, there are arrow which the lead can click to navigate in the bottom pane. While we try to make both options as mobile friendly as possible, this one is probably more so. This is a simple but effective landing-page website. It is designed to be used in your marketing efforts to attract sellers to list their homes with you – web, email blasts, signs, radio, and/or TV. The idea is to give sellers a quick glance at you and provide them with a call to action in submitting the form. We've partnered with folks who can help you market this in traditional media if that's something you'd like to pursue. Leads are emailed to your email address(es) or an email address you designate. We do not keep them or monitor their content (we do sometimes monitor their delivery status as needed), as those are considered your property. We do not provide them to any other party. We can send leads to a CRM program of your choice, but you would need to provide appropriate code or links to have our form feed directly to that program. This may be billed as an extra cost and is not, by default, included in the purchase price. By default, we do use meta tags in the lead email that is sent. These meta tags are recognized by some of the major real estate platforms. For example - the meta tag named "lead_name" in the header of the lead email is the same as the name field from the website. If your CRM can parse these meta tags, you should have no issue getting the correct information from the email. You can specify that we send to an email address utilized by your CRM or have the address you have selected for the website forward to the CRM's address automagically. Please see leadmetadata.org for specifications. We recommend using something that involves the agent’s name. 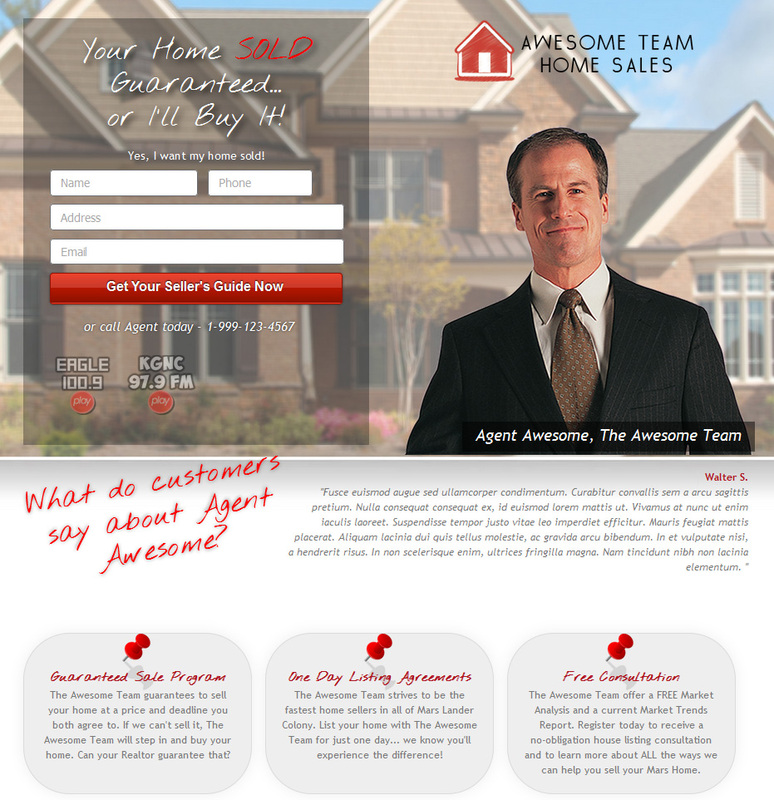 We have seen a lot of success with SoldByAgentName.com (for example). Because this is a promotion based on a particular agent, the agent’s name makes the most sense to us. A secondary idea would be to use your location name in the domain: GuaranteedSaleCity.com. We do not recommend using an existing domain on which you are currently offering MLS searching or offering specific other real estate services currently; those sites are traditionally built for "buyers" in mind, so it would not make sense to remove that avenue of business. It would be better to get a new domain unless you do not wish to use that website any longer. We suggest having a separate phone number to use on the website and in your marketing effort so you can track leads better. We do offer virtual toll-free and local phone numbers which we can automatically forward to a cell phone or office phone of your choice. We also offer SMS texting to that number which can be delivered to your email. We can also provide you with monthly reports of phone numbers calling that virtual number. This is not included with the agent package, but it is offered as an additional service. Please speak to your agent after the build for more details. Can we add additional pages to the website? No, this platform (at such an amazing price) is exclusively the single-page website as shown in examples. We will be happy to link your firm name to another website or we can quote you on a custom website, but it does not make sense to clutter the design with other items as that would defeat the purpose of having a single call-to-actions for sellers. In order to keep costs low on the website, we request that you send us high-res images for your agent image and company logo. If you have the original artwork for logos, that would be even better. We do not include image editing services with this platform; that is billed at an extra cost. However, we do crop agent images to fit, and will fix the background on agent images. The agent image should be one where the head and shoulders are not cut off by the edge of a picture, and it should be one in which the background is transparent in order to work properly. The final height and width is approximately 600px on screen if that helps. Notice the example on the right of an agent image where the shoulder was cropped before sending to us. 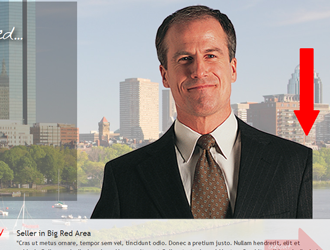 This makes the website ugly in our opinion by putting an arbitrary cut off to the agent's body. Company logos will be added to a header that is currently less than 150px in height. If your logo is vertical, you may want to swap to another logo or specify that we use text instead. Both the agent image and company logo should have a transparent background where appropriate. Anything else will not look right on the website. What about an agent video? We have some agents who choose to use a video instead of an agent image. That is no problem. However, we do not host videos. Please upload the video to YouTube, make it public, and send us the link. We will include an embedded version in your website in place of the agent image if you go that direction. Please do not send us both the video and the agent image, as we will not know which to use. 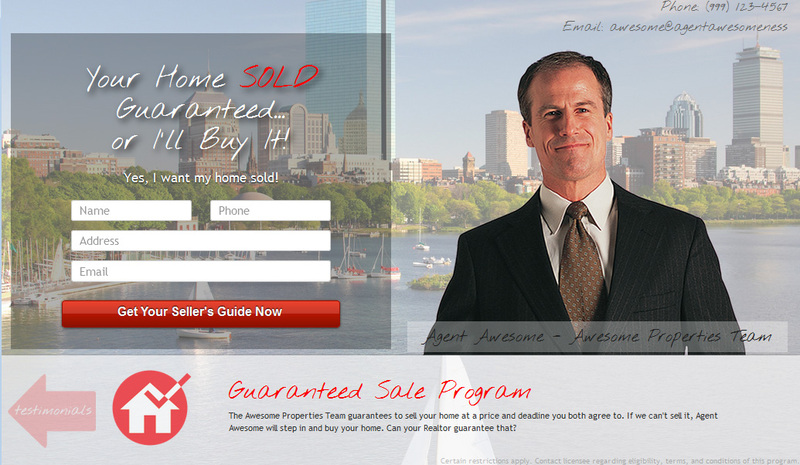 How does the "Guaranteed Sale" program work? The short answer is that it is up to the individual agent. We do not provide any support, legal advice, or materials for this program. It is purely a marketing concept for you to use within your platform and marketing efforts. We have many agents who have altered the wording of the slogan to fit their needs. Our customers usually reach out to the buyer as soon as possible and offer the buyer confidence in the agent's abilities backed by some sort of agreement to sell fast. We are not able to provide any further information than this. What is the seller's guide? We do not provide the seller's guide either. We would suggest something you put together that is very specific to your area, perhaps including neighborhoods, school zones, and a lot of information about your firm. We will provide settings and DNS information for your domain, but you will be responsible for your own domain name settings and pointing it appropriately. We cannot take on this responsibility as many people have complex setups or have multiple domains in the same account. Can I customize outside of the designs above? No, this is a platform service we provide, so we plug in your information and set it up for you. There is a great deal of customization in what we already offer, so we do not offer any customization not specifically mentioned here. How long does this website take to build? With the information requested, we can normally get the website out to you within 24 hours of you submitting to us. Each website is lovingly made by hand – not some auto generator. Yes, we have a template, but we have to make adjustments for your specific information, your wording, and even some images. When it is launched will depend on you and your domain registrar. It can take up to 48 hours to fully propagate so that everyone can see it once a website is launched. After you submit using the builder, you will be contractually obligated to pay the base fee for development as specified above. This will be invoiced to you using the information you provide to us. Each customization you make after the build process will be invoiced to you at $49.99 for each change. We are considering credit card payments, but, for now, payment by check or money order is the only acceptable payment method. Payment terms are always 30 days. If not paid in 30 days, your account will be assessed a late fee of 15% of the balance. After 60 days we reserve the right to discontinue and/or contact collections (or both!). Returned check fee is $40 plus any late fees incurred. Our terms of service are specified in the builder, and you can read them. However, be aware that you will be responsible for all collection costs if it comes to that.